In the landmark California patent case, a jury found Samsung's tablet to not infringe on Apple's D'889 iPad design patent, bringing into question the validity of an existing preliminary injunction against the device which was won based on the IP. Court exhibit from Apple v. Samsung trial. As noted by FOSS Patents' Florian Mueller, Judge Koh will have to weigh the alleged harm Samsung will suffer from the tablet ban's continuation against the likelihood of Apple's Rule 50 post-trial motion succeeding. A Rule 50 motion, otherwise known as an "overrule-the-jury" motion, can be submitted after a jury trial is completed to argue specific rulings and their effects related to the decision. Samsung proposed the Galaxy Tab injunction be dissolved immediately following the trial, asking that Apple's $2.6 million bond be retained by the court. Judge Koh did not agree with the Korean company's requests to dissolve or issue an indicative ruling saying the ban would be dissolved following a remand based on Samsung's federal appeal. The judge did, however, leave the door open for a possible lifting of the injunction in a recent indicative ruling, saying "Samsungs motion raises a substantial issue" regarding the jury's findings and how they apply to the Galaxy Tab ban. While Judge Koh has yet to offer any substantial clues as to what she might decide, the jurist did issue the preliminary injunction in June after a successful federal appeal by Apple, a flip-flop ruling from her initial assessment in 2011. Mueller notes that Judge Koh must assess whether the D'889 section of Apple's Rule 50 motion will be successful, causing a dilemma because she has the power to change her mind after hearing arguments at a Dec. 6 hearing regarding the post-trial motions. If the judge does in fact decide differently after the December hearings, it would be an admission that she incorrectly assessed Apple's chances of winning the Rule 50 motion as it applies to Apple's iPad patent. Even if the Galaxy Tab's preliminary injunction is dissolved after a remand, the ban can still be reinstated as early as December, but this time as a permanent sales blockage. 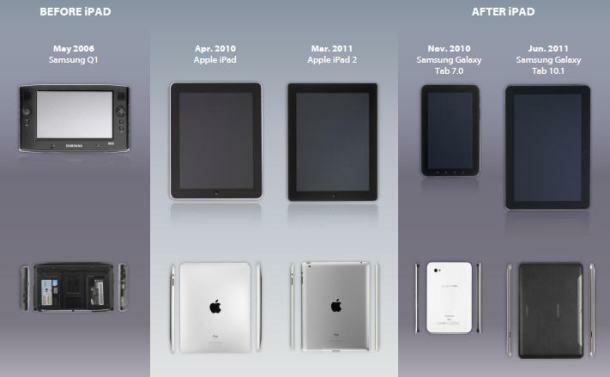 Although Galaxy Tab 10.1 sales are a non-issue at this point, mostly due to the release of Samsung's newer Galaxy Note models over the past months, Apple would like to set a precedent against the creation of iPad lookalikes. Judge Koh is set to rule on both parties' Rule 50 motions following the Dec. 6 hearing, and will possibly hear arguments related to the preliminary injunction remand in the near future.